Product information "Collagenase Type I (EC 3.4.24.3)"
Clostridium histolyticum collagenase is an enzyme mixture of collagenase, clostripain and tryptic and proteolytic activities. Collagenase type I shows a balanced activity of collagenase, clostripain as well as tryptic and proteolytic activities. 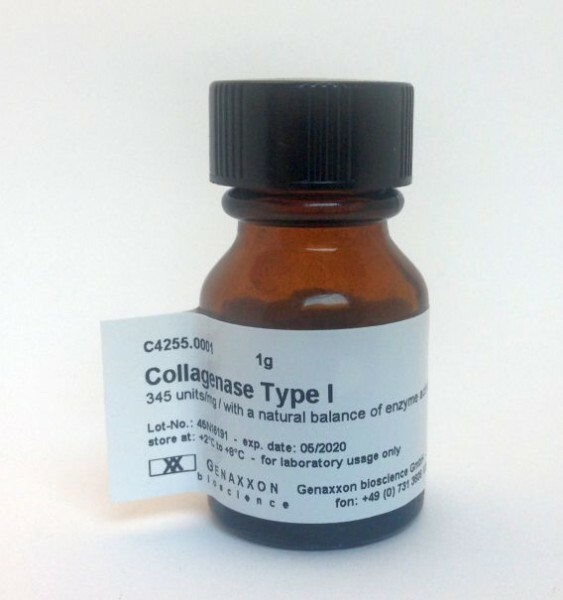 Type I Collagenase is recommended for cell preparation from epithelial, liver, lung tissue, tissue of the suprarenal gland and adipose tissue. The specific activity is 125 to 250 Mandl-Units per mg dry substance. Collagenase is produced by two separate and distinct genes in Clostridium histolyticum. Both genes have been cloned and sequenced (Yoshihara 1994). The colG gene codes for type I collagenase, a 936 amino acid protein, while the colH gene codes for type II collagenase, a 1021 amino acid protein. Both genes share 72% identity, the proteins only 43%. Both gene products can be present as two or more isoforms differing in molecular weight. Therefore collagenase mixtures can contain six to eight different proteins in a molecular weight range from 68 to 130 kDa. Substrate specificity studies have demonstrated that the colG gene prefers natural substrates such as intact collagen, compared to the colH gene product which preferentially digests short synthetic substrates (FALGPA) (Eckhard et al. 2009 and Matsushita 1999). More products around "Collagenase Type I (EC 3.4.24.3)"
Our comment on "Collagenase Type I (EC 3.4.24.3)"
Shows average amounts of collagenase, caseinase, clostripain, and tryptic activities. average amounts of collagenase, caseinase, clostripain, and tryptic activities. It is generally recommended for fat, adrenal, and liver cells. Recommended for cell preparation from fat, adrenal, and liver cells. Here you will find information and further literature on Collagenase Type I (EC 3.4.24.3). For further documents (certificates with additional lot numbers, safety data sheets in other languages, further product information) please contact Genaxxon biosience at: info@genaxxon.com or phone: +49 731 3608 123. Customer evaluation for "Collagenase Type I (EC 3.4.24.3)"